ERA Downey McCarthy are delighted to present no. 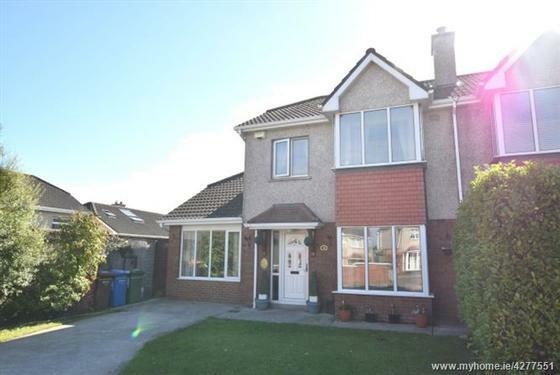 31 Brookwood Ballyvolane. Houses in Brookwood rarely come to the market so this is a great opportunity for purchasers looking for a quality home in this quiet and exclusive, niche development. No. 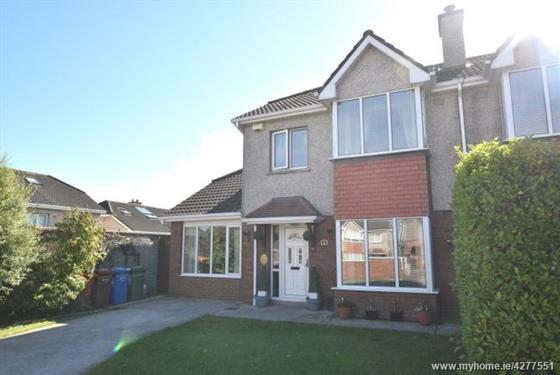 31 has the added benefits of a fine corner site that is South facing at the rear and extra room for a garage that has since been converted to provide more living space on the ground floor. 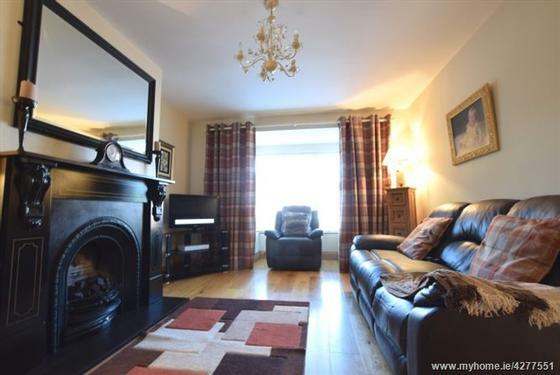 The property is very well maintained and beautifully presented and accommodation consists of Hallway, Living Room, Kitchen/Dining Room, Family Room, Utility Room and downstairs loo. 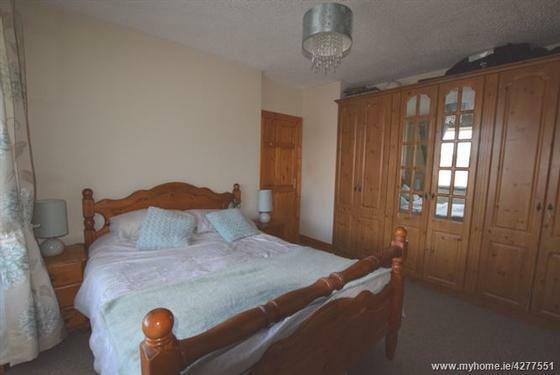 Upstairs we have 3 spacious bedrooms and a brand new bathroom. Viewing is a must to appreciate ! 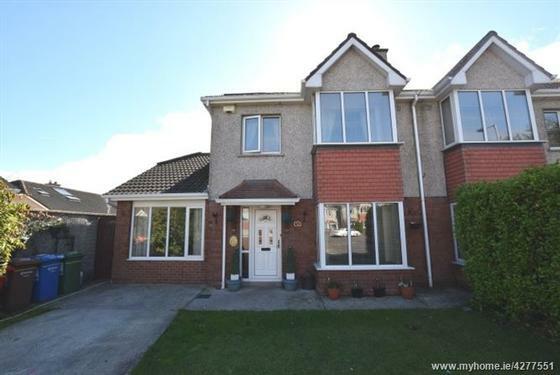 The property is situated on a fine corner site, a brick built wall to the front, mature hedging and a tall wall to the side enclose the property. A secure gate allows access to the side and to the back of the property. The front of the property has a concrete driveway which can accommodate parking for up to two to three vehicles. The front garden is laid to lawn and a concrete footpath leads to the front door. PVC and glass panel front door and leads into the hallway. 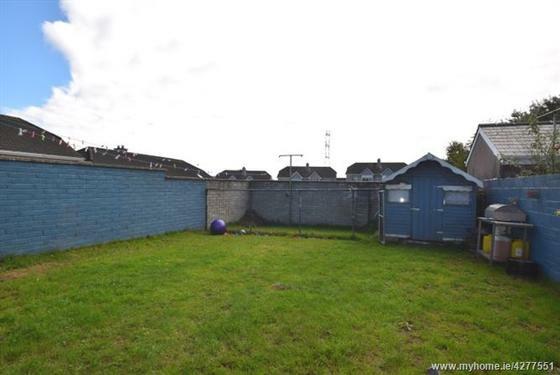 The rear garden is very spacious and measures 14m x 10m. The garden is laid to lawn and has a T bar clothes-line, Barna shed and a nice concrete patio area. 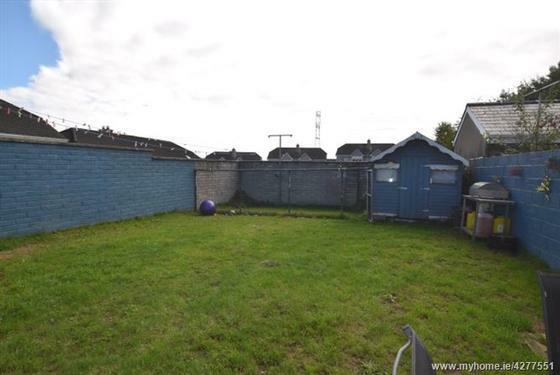 The back of the property is South facing and gets the sun all day long. 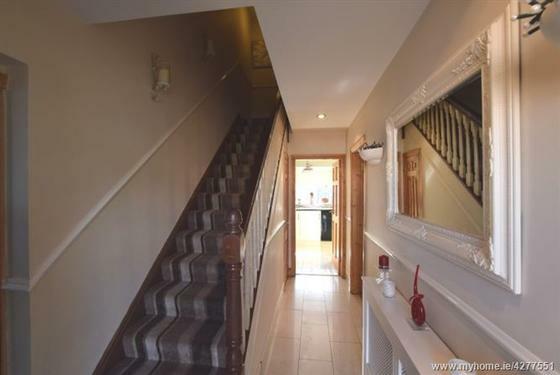 A spacious hallway with recess lighting in the ceiling, alarm console, radiator with a cover, one wall light and a fully tiled floor. Solid doors lead into all rooms and a downstairs W.C can be found under the stairs. The downstairs W.C has beautifully tiled walls and floors. The area has a built-in wash hand basin, one W.C and one light fitting. 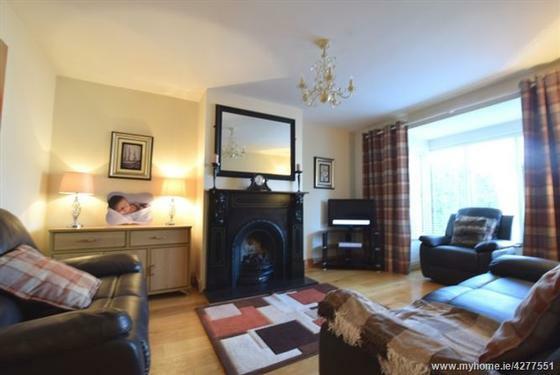 The living room has a feature bay window overlooking the front of the property fitted with Venetian blinds, curtains and curtain pole. 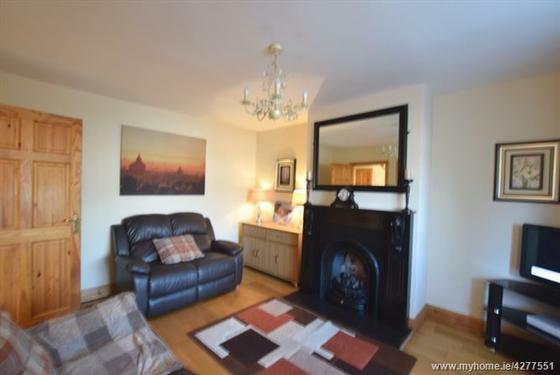 The room has a attractive décor throughout with a feature fireplace with a gas fire insert, solid wooden floor, one centre light fitting and one radiator. 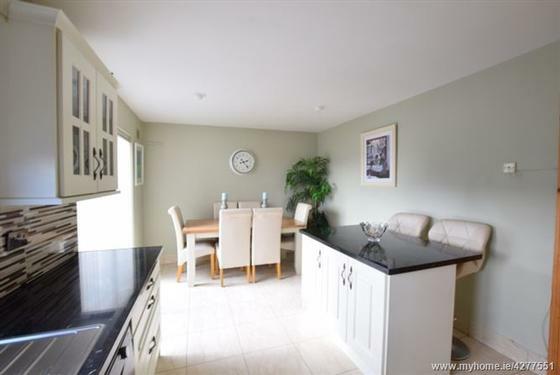 A beautifully appointed kitchen/dining with very attractive units at eye and floor level. The room has one window over looking the back of the property with a stainless steel sink underneath. 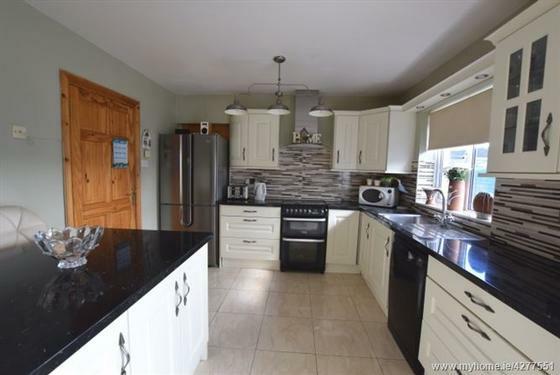 Features include space for a cooker and fridge freezer, integrated hob and extractor fan, spot light fitting, recess lighting and a beautifully tiled floor throughout. Sliding patio doors allow access out to the rear garden. This room has been converted from an original garage. 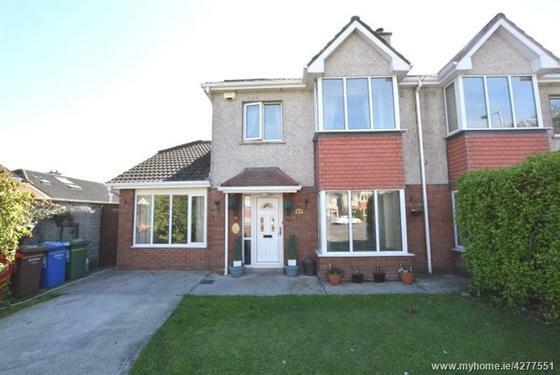 One large window overlooks the front with Venetian blind, curtain and curtain poles. The room has a very attractive walnut floor, recess lighting and an attractive décor light fitting. 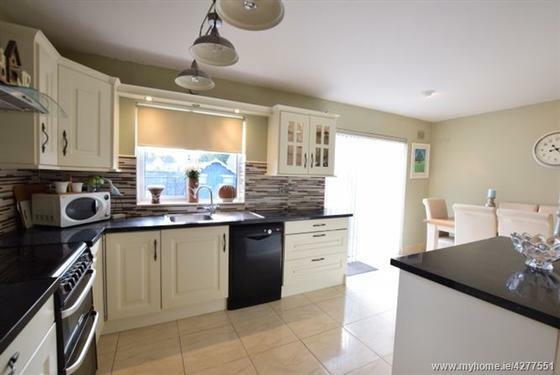 A solid door gives access to the kitchen if required and another solid door gives access out into the utility room. 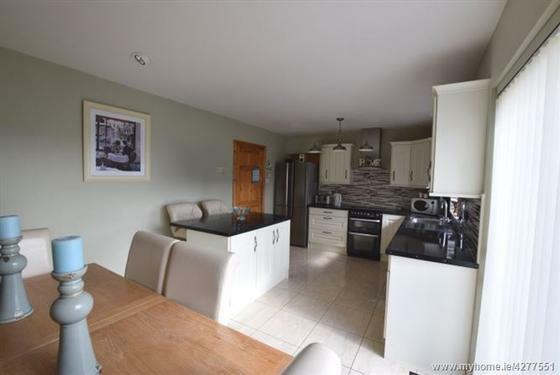 A very spacious utility room that houses the washing machine, dryer, freezer and gas boiler. One window overlooks the back and a glass panel door leads out to the rear. 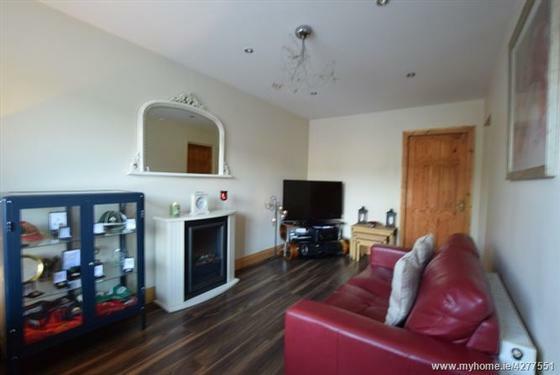 The room has a fully tiled floor and there is an access to the attic of the garage for storage. 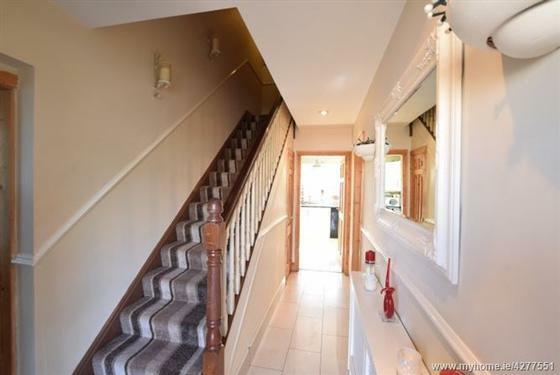 This landing has solid doors leading into all rooms, fully carpeted, one centre light fitting, smoke detector, an access hatch for the attic and the hot press is also situated on the landing. The hot press is shelved for storage. 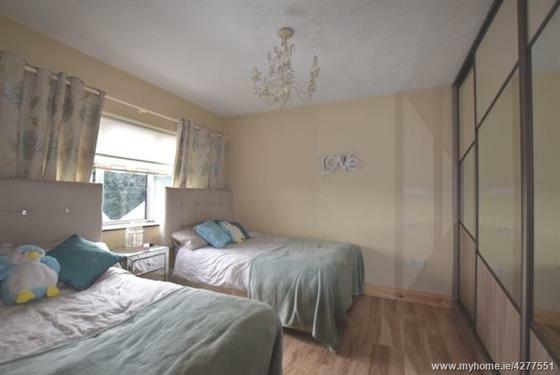 This bedroom has built-in sliderobes. 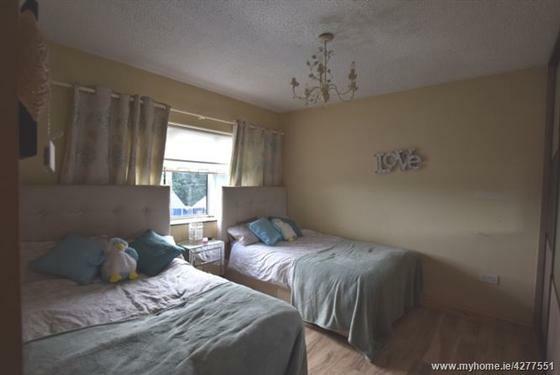 This room is a double bedroom with one window overlooking the back of the property. Features include one radiator, laminate wooden floor and a centre light fitting. 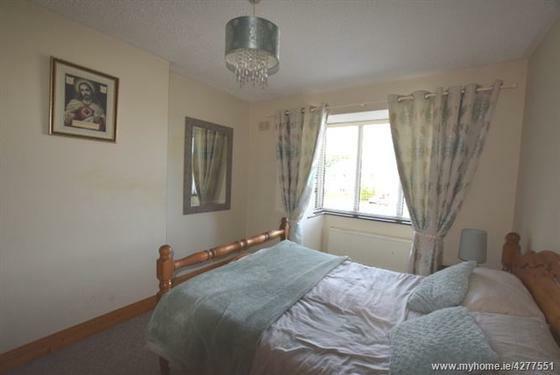 This is a single bedroom with one window overlooking the front. The room has a solid varnished wooden floor, tv point and centre light fitting. 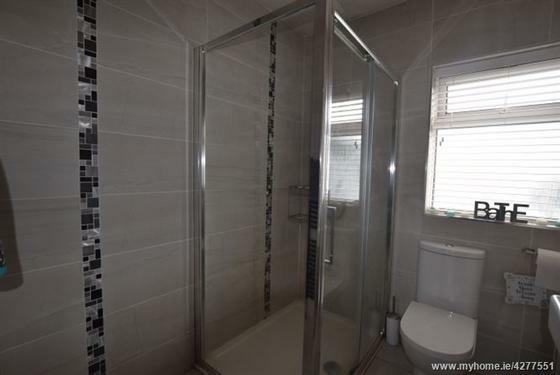 A newly fitted bathroom with fully tiled walls and floors. Most attractive bathroom comes with a newly fitted Mira Sport electric shower behind chrome and glass sliding shower doors. 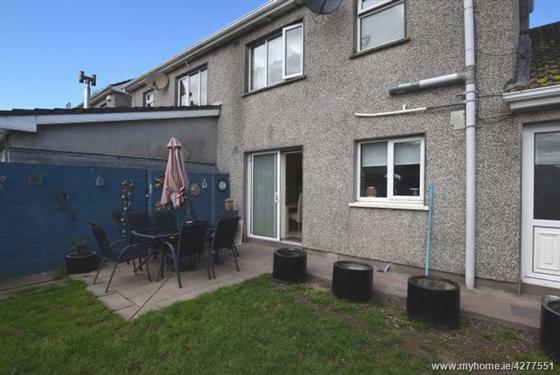 Features include one W.C, one wash hand basin, a mirror with fitted lights, one centre light fitting, heated towel rail and one window overlooking the back.